Raman spectroscopy characterizes materials by measuring frequency shifts in inelastic light scattering. It is used to acquire the frequency spectrum of vibrational excitations (phonons) and electronic excitations in solid, liquid or gaseous samples. In the solid state it is applicable to samples in bulk form, thin films, and microscopic structures (e.g. device structures or particulates). This technique is non-contacting and non-destructive (~50mW at the sample) and enables analysis through transparent layers. The MuAnalysis system has 0.2 wavenumber spectral resolution, with 1um spatial resolution, but identification of sub-micron size particles is feasible. For identification of unknowns, MuAnalysis maintains an extensive on-line custom library of Raman spectra. 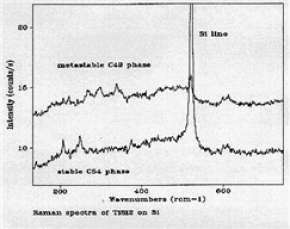 Raman spectroscopy is a non-destructive technique based on inelastic light scattering. It can be used to characterize materials, thin films and structures. © 2019 MuAnalysis. All Rights Reserved.